Mobile learning program Text2Teach is set this school year to boost the quality of education in 15 elementary schools in Patikul, Sulu, one of the most remote island groups in the Philippines where student dropout rate has reached alarming proportions. The Text2Teach launch in Patikul, Sulu was led by its governor, Abdusakur “Totoh” A. Tan II, third from left. 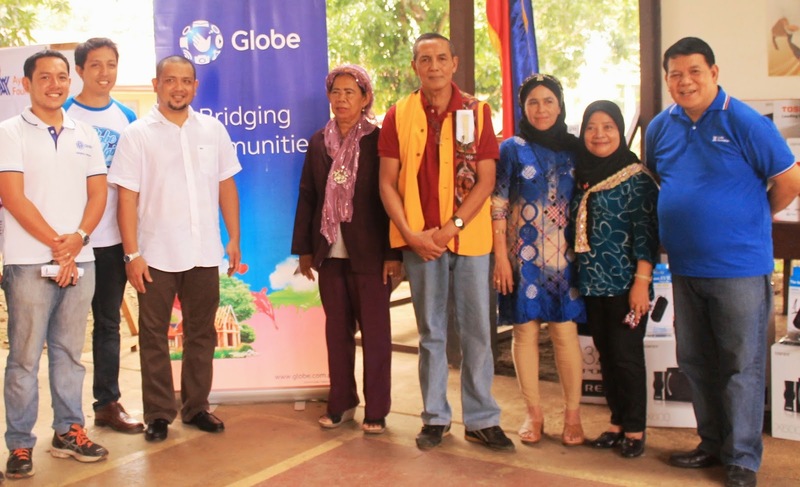 Together with him are (From L-R): Fernando Esguerra, CSR Director, Globe Telecom; Miguel Bermundo, CSR Expert, Globe Telecom; Sabiriya I. Hadjirul Ed.D, Education Program Supervisor, DepEd; Farouk B. Yunus Ed, Education Program Supervisor, DepEd; Sitti Lina A. Asjali, West District Supervisor, DepEd; Mercia Salarda Alli, Chair, Matawkasi Inc.; and Archimedes G. Velasco, Senior Manager, Ayala Foundation, Inc.
Text2Teach is a collaboration between the private and public sectors composed of Globe Telecom, Ayala Foundation, Nokia, Pearson Foundation, Toshiba, the Department of Education, and the local government units. This effort also serves as a catalyst for peace and development efforts. Text2Teach helps forge and deepen cooperation between the local government of Sulu, the Philippine Marine Corps, and the academe to engage in educational programs as an effective way to pursue peace and prosperity in the Autonomous Region in Muslim Mindanao. Educational materials will be provided to the youth in Sulu for them to receive the same kind of learning materials received by the rest of the country. The Text2Teach training program is expected to boost teacher morale and enhance the learning environment in the classroom, with the end-goal of significantly lowering the drop-out rate and significantly increase the learning gains. Through Text2Teach, the alliance aims to address the lack of appeal of education by providing an abundant supply of teaching resources such as 360 educational video materials on English, Math, Science and Values Education downloaded via Nokia Education Delivery. The videos which can be played in a 32" LCD TV donated by Toshiba provide a highly-effective visual aid for teachers and create an interactive, student-focused learning environment in the classroom which makes the students eager to attend school. It comes with lesson plans that are fully integrated into the basic education curriculum and created to meet local education guidelines and standards. Meanwhile, Globe also provides pre-paid SIM cards, free P150 monthly load allowance for one year to each beneficiary-school to be used for helpdesk concerns, and an additional P1,000 load if there are new or updated materials to be downloaded using its network. There are now about 1,054 Text2Teach schools nationwide with the alliance looking to increase count to 1407 schools by the end of the year.